Availability:: Same day despatch for items in stock if ordered before 2pm. 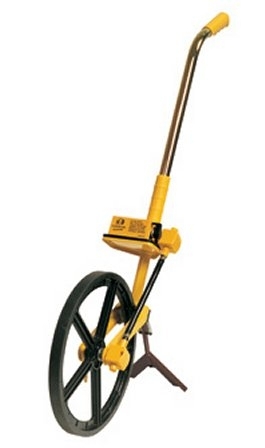 Professional and robust road measuring wheel with built in stand and brake. The wheel is available in metric or imperial versions and is ideal for any distance measuring application. This has become the industry standard over time outperforming cheaper competitors versions, many customers who have tried cheaper versions usually come back to the Trumeter 5000 due to the quality. The precision mechanical (metric) readout counter measures up to 99,999.9 metres (metres and decimetres), adds when going forwards, subtracts when going in reverse and has a reset lever to return the count to zero. Shipping box dimmentions 57cm x 45cm x 22cm. For telephone orders please call 01453 886440. 30 day accounts available please call us to apply.